CAP is staffed by one part-time employee who manages the program and a dedicated group of volunteers. Our volunteers are special people ranging in age from the teens to the golden years. 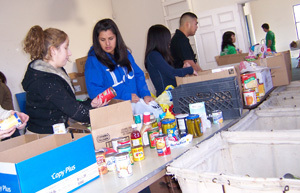 They come from several local churches, civic clubs, and many individuals who love helping others. Last year our volunteers logged over 3000 hours. You can become part of this great team by becoming a volunteer. We operate our program on Tuesdays and Thursdays between 10am and 1pm. Volunteer time can be for an hour/ day/week/month. All are welcome! If you are interested, please call (951) 485-7792 or Email CAP. Volunteers are the backbone of CAP. I have a group of volunteers who are very special to me and to this community. I wish good health and a bright future to all those who have served CAP so well. To those who continue to serve, I say thank you so very much for your service and fellowship with CAP.